That 'gravitational force' is produced by objects only proportional to their inertia or mass, seems proven by Galileo's on-Earth experiments, by Newton's proof that planet motions seem consistent with that, and it being demonstrated with laboratory masses by Cavendish in 1798 (see Vision Learning Gravity). And that 'gravitational force' decreases with the square of the distance from a producing object seems proved by Newton's gravitational planet motions and by the 1798 Cavendish experiments. Of course there are claims that this does not hold accurately always, mostly based on astronomical evidence of apparent amounts of gravity and apparent amounts of matter in space seemingly having both localised and universe-wide discrepancies. Some try to explain such apparent gravity discrepancies by assuming the existence of local Black Holes and universe-wide Dark Matter, though with maybe little if any direct evidence. Applied external forces generally, including 'pushes', seem to accelerate bodies in inverse proportion to the mass of the body. That bodies responses to gravity seem likewise inversely proportional to their inertia or mass, is consistent with Newton - and with Galileo demonstrating that all objects fall to the surface of the earth with the same acceleration, independent of the density or inertia or mass of the falling object. That applies to all kinds of force, but to date gravity is the only natural force with good evidence of also being produced in proportion to a source objects mass (but generally bigger magnets also give stronger magnetism, and a larger number of electrons give stronger electric attraction). Of course these facts are maybe not full proof that gravity is actually an external force pulling bodies, only that gravity works like there is an external attraction 'force'. Gravity is 'universal' or indiscriminate, in affecting all material mass bodies, unlike eg magnetic force but like 'contact push force'. It is easy enough to build mobile robots that each emit signals proportional to their mass and each accelerate themselves towards another in proportion to the strength of received signals and in inverse proportion to their own mass. Though such gravity-robots can be built and could be very useful for gravity research, it seems that no physicist has actually tried building them to date. Now anyone can download free a practical Ebook manual "Build A Remote-Controlled Robot" by David Shircliff from Hotfile.com at http://hotfile.com/dl/94090930/a5870ef/Build_A_Remote-Controlled_Robot.rar.html Such 'gravity robots' would be dynamic gravity model mimic equivalents of William Gilbert's dynamic magnetic Terrella models of the magnetic Earth which he used for many of his interesting magnetism experiments. Of course such 'gravity robots' could only mimic gravity with response programs as Newton's laws or others, while Gilbert Terrella models involved actual magnetism. Gravity would have to be a much stronger force than it is to have useful 'Gravity Terrella' models - small black holes might do well if they can be produced and controlled ! That gravity production and response can be mimicked by robots emitting signals and responding to such signals, is of course no real evidence on whether gravity is actually produced and actually works in such a manner or not. But that can certainly be made to work and help explicate gravity and perhaps other physical forces while not needing billions of funding, though a realistic equivalent push-physics gravity model maybe looks less attainable. Isaac Newton produced the first good gravity theory, apparently based on William Gilbert's 'attraction physics', and then Albert Einstein produced a spacetime continuum gravity theory related to Johannes Kepler's field-push physics. But some have claimed that gravity has issues that may challenge both gravity theories. Gravity can work at different levels at the same time - as in attracting an apple to the ground and in holding the Moon in orbit around Earth. It can produce actual or potential accelerations of various bodies, with varied possible effects at very large or small distances. But the motions of galaxies appear to some to require much more gravity than the visible components of such galaxies should produce. This has led some to conclude that there must exist some Dark Matter producing extra gravity, perhaps based on uncharged and maybe slow-moving neutrino-style particles (of small or big mass) that interact little with normal matter and so will give little evidence of their existing. Of course dark matter can go with attraction theory physics which has no requirement that matter emit light, and indeed has no general requirement for light - unlike Einstein's relativity theory. But dark matter could also maybe go with some other physics, and dark matter might also require some as yet undiscovered dark forces ? Instead of dark matter for 'missing gravity', Modified Newtonian Dynamics or MOND gravity theory basically involves gravity response maintaining a minimum value even when gravity signals drop - so giving more gravity than expected as at galactic-plus distances. This is of course compatible with an attraction physics signal-theory in which response to signals might be expected to have some minimum level. For recent evidence supporting MOND gravity see Galactic Gravity. Of course some signal response systems can involve all-or-none digital-type response, and/or signal-threshold response, response delay times or other signal response effects. So identifying all applicable parameters for a signal-response gravity covering all circumstances may not be easy and may need much more accurate and complete data than is now available. Some areas of the universe that appear to produce more gravity than their visible components ought, are thought by some to contain super-compressed matter as 'Black Holes', whose gravity is claimed to be extremely strong and to be able to even prevent the emission of light or other radiation from itself. Of course this requires that light can respond to gravity as objects with mass do. But in General Relativity gravity is basically only space curvature, so to confine emitted light would seem to only need the spacetime continuum being 'closed down' locally - however in that case the gravity within a black hole should also be confined and have no effect beyond it ?! A basic conflict with the evidence if General Relativity was true, so black holes certainly cannot be evidence for that theory. And black holes can go with attraction theory physics which can allow of light being attracted by some force, with Newton giving possible explanations of the reflection and refraction of light by local attraction acting on light. Black holes could also maybe fit with some other theories. Of course for anything, including Einstein's spacetime continuum, to have variable curvature it must be a pushy thing and a pushing thing - which Einstein insisted his spacetime continuum could not be in his physics ? So his physics does not really give any actual explanation for gravity or how it works. A simpler possible explanation of both dark matter and black holes might be that light emission and lower matter density is associated with charged particles. Uncharged particles and gatherings of them may be more common in the universe generally than apparent on earth. A gathering of neutrons or neutrinos could be both darker or blacker and denser,without involving any strange theory. Neutrons or neutrinos look more like simple 'Descartes-atoms', and indeed it may be that charged particles and more light emitting matter based on them are actually the somewhat rarer phenomenon. Gravity acting as an attraction force, it perhaps should cause the universe to be contracting. And there does seem to be evidence of at least some gravity contraction in that most galaxies seem to have a greater concentration of matter nearer their centres. However there is claimed evidence for an expanding universe, basically resting only on observation showing that light over longer than galactic distances appears to lose more energy - though there could well be other more likely explanations for such observation. The evidence for the universe expanding, is largely apparent Hubble light redshifts being greater for more distant galaxies. The Doppler relative-velocity Effect (apparent change in frequency and wavelength of a wave for relative movement between it or its source and an observer) may be applicable to starlight. So physicists now commonly assume that the received amplitude of starlight must be a linear measure of the distance of its source, and star redshifts being related to starlight amplitudes is taken as being a measure of universe expansion. But the Tired Light Theory of Fritz Zwicky posits that star redshifts are a measure of the energy depletion of the amplitude of light from travel over great distances and indicating a non-expanding or even contracting universe. And over such large galactic distances very small reductions in the speed of light over very small gravity gradients may give another possible mechanism as Hubble favoured in his 'Tired Light' Theory? A. The universe began with an explosion and momentum maintains its expansion at some fixed velocity. B. There is a stronger repulsive force working against gravity expanding the universe at some fixed acceleration. Apparent Hubble light redshifts being greater for more distant galaxies, if due to the Doppler relative-velocity Effect being applicable to light, seemingly supports a B type expansion rather than an A type expansion. However B needs a suitable repulsive force and some posit Dark Energy for that, but there is little supporting evidence. Of course there could seem to be other possibilities, one being a gravity expansion involving gravity from outside the currently visible universe as from an external shell of matter or from 'invisible dimensions'. C. The universe began with an explosion and momentum maintains its expansion at a fixed velocity but with centralised gravity decelerating bodies nearer the centre more strongly than bodies further from the centre. This should give Doppler red shifts that are stronger towards the universe centre than towards the universe edge radially, but with some blue shifting tangentially. D. The universe is gravitationally contracting, with centralised gravity accelerating bodies nearer the centre more strongly than bodies further from the centre. This should give Doppler red shifts radially towards and away from the universe centre but with some blue shifting tangentially. The explosion Big Bang explanation, A, alone should give no Doppler redshifts - while B, C and D explanations should give differing redshifts more radially than tangentially to different extents. Einstein time-dilation gravitation-redshifting predicts some redshifting from higher-gravity locations and blue-shifting from lower-gravity locations. Many current astronomers support a general space-expanding explanation, and some even a FitzGerald matter-shrinking explanation, giving Doppler-equivalent redshifts. What explanation, or combination of explanations, of apparent universe-expansion is more likely depends on having exact numbers for redshifts, distances, velocities and masses - and current astronomy numbers are maybe not very exact, but if the universe is expanding that does not itself seem to favour any of the general physics theories particularly. Classical relative motion involves the Addition of Velocities Effect which basically says that for any two bodies moving towards each other, at velocities v1 and v2, their relative velocity is v1 + v2 with opposite motion being a -v. The Doppler Effect simply applies this to periodic emission motions, such as are commonly found in waves in mediums. For waves, their frequency is their velocity times the inverse of their wavelength, or is their period per second, as F=v/L. Periodic particle beams, eg of particles emitted each 5 seconds as their period, can have equivalent measures including frequency, velocity and period length. Hence a positive velocity of a signal detector relative to any periodic signal, adds to the relative signal velocity and so increases the signals apparent frequency and decreases its apparent wavelength or period length as F=(v1+v2)/L, and no accelerations or acceleration forces are required for such Addition of Velocity or Doppler effects. (an increased apparent frequency can be called a blue-shift and its opposite a red-shift). Einstein claimed that light uniquely does not show classical relative velocity effects, but does show both acceleration effects and gravitation effects from his claimed Acceleration-Gravity Equivalence Principle. Light passing a massive body will be deflected towards the body as its speed is reduced more in regions of greater gravity or under greater acceleration - and it will hence also suffer some reduction in frequency (red-shift)...predicted effect values are greater than classical motion effect values alone, but in itself that still allows that the classical effect may hold but with some extra factor also applying. Newton showed that the strength of gravitational attraction seems to decrease in proportion to the square of the distance from a source object, and one explanation of that might be something emitted spherically from the source and diluting with distance with zero attenuation, as would the surface area of expanding spheres around it. The surface area of spheres is proportional to the square of their radius. Of course at present the only gravity detectors we have are other gravity sources responding to gravity, which perhaps cannot distinguish gravity being actually directed spherically from gravity being directed to other gravity sources ? The fact that bodies like galaxies and solar systems seem generally to be flat discs, rather than being spherical, may cast some doubt on gravity being actually spherical and require another explanation for Newton's inverse square law ? Newton's inverse square law for gravity is of the form G(d) = Go/(d.d), in line with unattenuating spherically diluting signals, but may not precisely hold for all distance scales. Non-spherical attenuating part-diluting signals should mean an equation form G(Xd) = (Go/(π.((d.TanX). (d.TanX)))) - 10alog(d), which could possibly match Newton's law over some range of equation values and might have wider application also ? At the atomic level, spherical non-discrete forces may seem to fit more with field, wave or space continuum ideas while non-spherical discrete forces may fit more with body-body digital signal ideas. The fact that electrons seem confined to very specific atomic orbits maybe better fits a non-spherical non-continuum force holding them, and if one force is non-spherical and digital then maybe all such forces are also. Many scientists and mathematicians have considered the sphere to be the most 'perfectly ordered' of shapes, but in nature the spherical is often in fact the most disordered. If something basically has some specific linear emission directionality, then lots of things having random linear emission directionalities will average an approximately spherical emission directionality. A spherical directionality can be effectively no directionality or random directionality. The Sun seeming to emit both light and gravity spherically does not prevent either such emission at the atomic level from perhaps being directionally linear emissions. And the claim that particles and medium-waves differ in the former propagating linearly and the latter spherically may hold only at some general approximation levels reflecting the extent to which mediums traversed do or do not disorganise their transit. If gravity basically involves straight-line body-to-body signals then part of signal dilution with distance could be due to relative body-body motion and might also include some movement anticipation with apparent faster-than-light response as considered near the bottom of our main section on Einstein. Of course if that holds between two elementary particles, a large isolated body having vast numbers of such particles could be expected to leak some gravity signals spherically and that leakage might reasonably approximate to Newton's inverse square law with a little extra attenuation. The gravity between two large bodies would be leakage gravity plus some body-body gravity that might about balance any extra attenuation. Distinguishing and quantifying the various factors in such gravity would not be simple. If bodies emit gravitons only in response to gravitons received, and if the probability of a body emitting a graviton in response to a graviton received is proportional to the mass of the body, then two isolated bodies at relative rest should maintain some graviton emission intensities directed at each other proportional to their masses. And if there are also additional background random gravitons of some intensity then, in response to that, the two bodies should also maintain some additional spherical graviton emissions with intensities proportional to their masses ? The orbits of artificial Earth satellites seem to support Earth's gravity being spherical, and the directionality of Earth's gravity signal emission being independent of the directionality of its gravity signal reception from other bodies since it does not seem to be significantly stronger facing the Moon or Sun ? Of course Earth's tides do not require big pulls from the Moon and Sun, for the Moon being about 1 × 10−7 g. Where gravities are strong is interesting but where gravities are very weak may be very interesting but difficult to detect and measure. Of course gravitational bodies can move, have tides, collide, contract, expand or explode and show other change producing gravity perturbations or waves that may be very hard to detect if distant. And different gravity theories may also predict differences in gravity that may be very hard to detect. A somewhat improved version of Descartes old particle-push gravity theory was propounded first by Nicolas Fatio in 1690 and then maybe independently by Georges-Louis Le Sage in 1748 and can be termed the particle push Shadow-Gravity theory. Supposedly proven and in line with general Cartesian physics, it claimed that bodies shielding each other to an extent from 'universal gravity particles' would be attracted to each other in accordance with Newton's laws of gravitation. It requires space everywhere having lots of some randomly moving fast particles (or maybe waves) of unknown origin, but it has been claimed that they would create excessive drag and heat that is not observed and involves other problems. Most physicists rejected this theory with Newton rejecting the Fatio version and Maxwell the Le Sage version. Of some small interest is the fact that Le Sage's father in the 1720's to 1740's seems to have supported Gilbert-Newton attraction physics against Fatio-Le Sage Cartesian gravity physics, publishing in 1743 "Truth is not always probable. In physics, the principle of impulse is most probable; but that of attraction is established fact." He was aware of the Cartesian physics preference for impulse (contact forces) as the means of conveying every causal effect, and the apparent difficulty of explaining gravity that way. Newton raised the drag issue for gravity mechanisms that involve push - and the issue holds for any particle, quantum, field, ether, or continuum mechanism that works by push - since push should produce drag and/or heat and there is strong evidence that space produces very little drag or heat for planets or other bodies. Of course some kind of push gravity may still be possible with the right mechanism, which might need most of the push to somehow convert to eg spin energy instead of drag or heat ? Maybe even some field-push or continuum-push theory not yet fully specified ? Of course that would seem to need a response mechanism of some kind and so might still favour an attraction gravity or signal-response gravity that seems more able to avoid the problem perhaps ? This maybe does not help clarify whether Newton actually first thought of gravitation as being an attraction or as being a pull or in line with his later published position as being possibly either. Newton's own words include no gravitation 'drawing', only "attraction(signal response) OR impulse(push-pull)". Rather perhaps Stukeley exemplifies how Newton's actual gravitation theory ideas were misrepresented while his physics mathematics were misappropriated for a Descartes mechanical physics when they perhaps better fitted a William Gilbert effluvia-signal-processing attraction information physics. Strong sources of magnetic force can be moved and otherwise controlled by a scientist, unlike strong sources of gravitational force. And everything responds similarly to gravity, but only some things respond to magnetism and some magnetic effects are said to work at greater distance than others, and some to work slower. If magnetic signals go to the same distance and are the same speed but responses and response times differ then that would seem to prove that a signal-response effect is indeed involved and William Gilbert concluded that he had proven that for magnetic force. But the nature of gravitational force does not allow such direct experimental proof for how gravity works excepting that the mathematics for gravity are basically consistant with that for magnetism so that it must also be a similar signal-response force. Both Gilbert and Newton seem to have believed this though Newton did not fully commit to it publicly. Gravity may be big but magnetism is maybe really key to physics. (auf Deutsch - Die Attraktivität Theorie von schwerkraft und andere kräfte). 1. Does a mass with more energy generate a greater gravitational attraction than the same mass with less energy, ie does energy like mass also generate gravity. 2. Does a gravitationally accelerating body actually show any net gain or net loss of mass and/or energy from its gravitational acceleration ? While there is evidence that any such effects must be small, in line with gravity being a weak force, there seems to be no further real experimental evidence to date on such effects ? Newton certainly proved that gravitational attraction seems to normally transmit at some very fast speed, and seems to normally work in straight lines - to at least some good approximation for most common circumstances. There remain issues about the exactness and the universality of both these aspects of gravity, with some claims for a gravity speed-of-light fixed velocity and for gravity bending like light if not having some other light-like properties. To date there seems to be no evidence that gravity or magnetism reflects or refracts like light does. Gravity affecting many objects to some extent that may be very weak, it may never be possible to prove that something is entirely unaffected by gravity or is entirely 'massless'. 2010 sees a 'holographic information physics' being 'logically' developed from string physics by Dutch physicist Erik Verlinde and others. Variations in entropy (or temperature-like) directional information gradients with matter location exist, and they somehow give directional pressures or forces acting as gravity. This physics seems to require that statistical entropy information has some actual existence and is more fundamental than matter, energy, space or time - which may be impossible to actually prove. And some supporters of M-theory basically posit that the universe is an information hologram. Gravity has been claimed to also have weaker effects producing motion in a direction other than attraction's normal directionality. Hence gravity has been claimed to have a 'Geodetic' or 'de Sitter' effect such that the gravity of a fixed body will produce precession in a body orbiting it. Gravity has also been claimed to have a 'gravitomagnetic' or 'Lense-Thirring' effect such that the gravity of a rotating body will produce rotation in a fixed body near it. These claimed gravity effects may seem doubtful, since comparable proved properties of magnetism affect chiefly body alignment and not body precession or body rotation. Magnetic bodies suspended over our magnetic Earth do not seem to show regular rotation or to show precession, and only show a small 'rotation' to reaching some fixed alignment position ? Of course gravity could maybe show some different effects, but the evidence is maybe not strong. The Strong Force that applies to some sub-atomic particle has been claimed to actually be gravity, though stronger by a factor of around 1038 over a very short distance range only. It has been claimed that then Einstein's General Relativity equation k = Gs. (8π/c4) where Gs is the 'strong gravity' value of the G of normal gravity, can predict the masses of strong-force Hadron composite sub-atomic particles - but not of non-strong-force Lepton elementary particles. For these claims of gravity taking two forms, no explanation seems to have been posited yet , but if gravity is a response to signals then there being two types of responses might well be more readily explainable [ see http://arxiv.org/ftp/astro-ph/papers/0701/0701006.pdf ]. Attempts to explain gravity as a small difference between electric charge repulsion forces and simple electric charge attraction forces, face the problem of similar charges seeming to distribute similarly (eg negative charge particles orbiting outside positive charge particles) with such attraction being between dissimilar charges. Hence negative charges being on average 1% closer to other negative charges and positive charges being on average 1% further from other positive charges, leaving opposite charges on average the same distance apart, need not affect net attractions (or net repulsions). The same holds for any regular dipole distribution for simple electric charge forces. Experiment does not seem to support any universal electric charge distribution in matter that could give a universal gravity effect that way, without the addition of perhaps debatable secondary field effect assumptions. Of course both Newton and Einstein did much on gravity, though gravity is basically the simplest of forces in being just attraction. They both made no real attempt to explain the much trickier force of magnetism as shown by William Gilbert's published experiments. Indeed although some more modern physics theories do appear to explain some part of magnetism, chiefly its attraction and repulsion effects, none explain all of the various magnetism effects as well as Gilbert's own action-at-distance physics theory. Physicists today of all theory inclinations could really do with a close study of Gilbert's 1600 'De Magnete' especially perhaps in its most recent translation. Attempts to replace Einstein's gravity theory with a quantum gravity theory that works have been various and all unsuccessful to date. Maybe a better quantum gravity theory would be a quantised signal theory gravity, more in line with a William Gilbert style action-at-distance physics ? Clearly if gravity is one push thing, then evidence for it being quantized is simply evidence for gravity being quantized. But if gravity is a dual thing involving both signals and responses then an apparent quantization of gravity could be just the quantization of responses to gravity, whose signals themselves might still be non-quantal ? Or the two could actually be differently quantal ? Distant stars all around Earth show an about even distribution of redshifts claimed to be due to universe expansion, though that would seem to require that Earth is located at the center of the universe which seems highly improbable. There is increasing evidence for redshift 'quantization' that suggests redshifts may not be due to the universe expanding (and incidentally that there may not be 'missing mass' dark matter) - Setterfield. There is also some evidence that redshifts may be slowly reducing with time, possibly due to the speed of light slowly decreasing quantally with time (maybe due to gravity or other energy fields slowly increasing quantally with time ?). Perhaps little is yet really known about distant space or really about gravity. A signal-response physics might perhaps more easily explain both Dark Matter and Dark Energy. Hence 1. at edge-of-galaxy distances gravity weakness, responses to gravity may somewhat strengthen with distance mimicking Dark Matter, and 2. at further-from-galaxies distances further gravity weakness, signal strength may weaken with more distance mimicking Dark Energy. And similar effects might possibly be predicted also for other forces besides gravity. 1. The total gravitational attraction exerted on the Sun. 2. The mean directionality of gravitational attraction exerted on the Sun being equatorial due to orbit planes. 3. The point gravitational attraction exerted on the Sun due to planets being discrete. 4. The time variance of point gravitational attraction exerted on the Sun due to planet orbit velocities giving varying degrees of planet conjugations. These gravitation factors must be the chief causes of the observed instability of the Sun as shown by solar activity and its significant variation over time. This solar instability would be reduced if some of the planets orbited the Sun in a plane at 90 degrees to their present orbit planes, though somewhat strangely that seems rarely the case in natural solar systems. 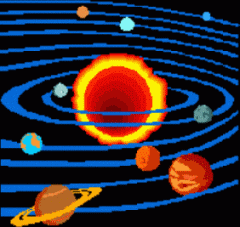 For more on this see our section on Solar System Problems.